I'd better post this before all the snow is gone here in southern Maine (oh, I know there will be some more, but tomorrow is the first day of spring, and I'm perennially optimistic). 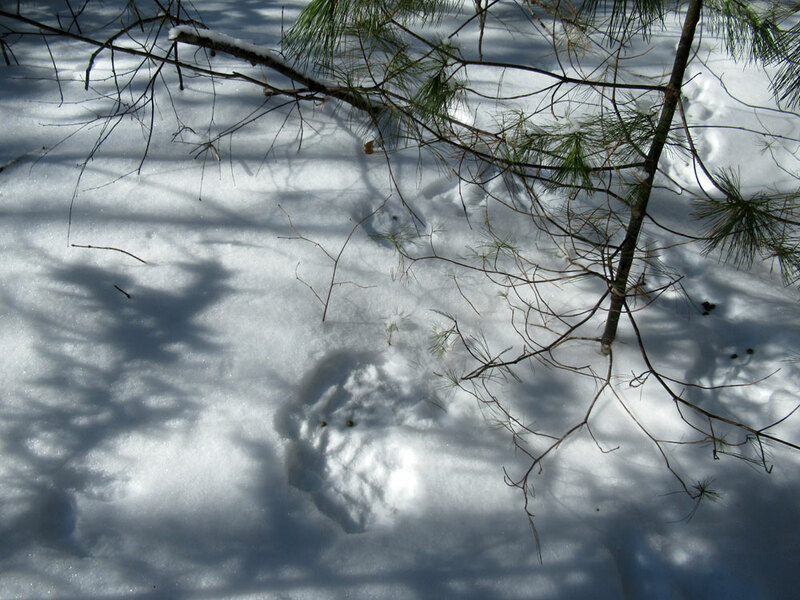 Back in February I had a chance to go out tromping with a friend, and it being the day after a snowstorm, we found a smorgasbord of animal tracks. 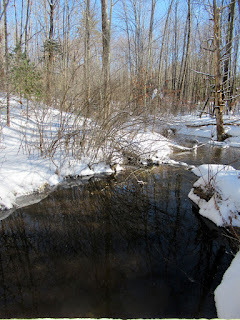 Even in winter some streams keep flowing. 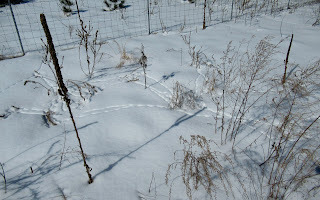 This time we'll look at some other tracks and traces left in the snow from that same trip. The first set wound up being a bit of a joke on us. 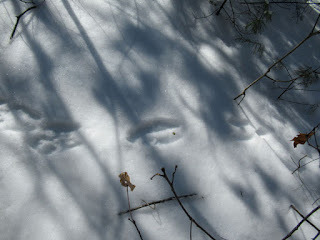 At first we came across what at a distance looked like the flurry a grouse might leave in the snow. But on closer inspection, it was pretty clear that it was the sign of a very busy rabbit or hare (not sure whether it was cottontail or snowshoe, but more likely cottontail). Note the telltale droppings, like little punctuation marks! 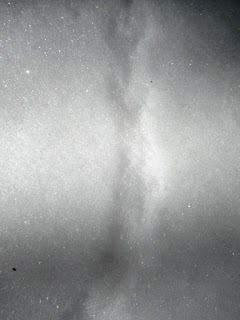 Pretty soon all that will be left are pockets of snow in the shadowy areas, and some ice here and there. Come May the leaves will be budding, and eventually leafing out. Not long now! Happy spring, everyone. 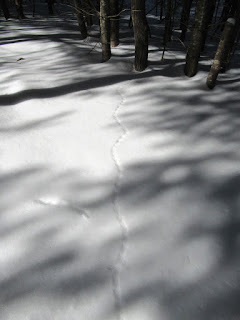 It might not be "strange," but it is rather magical to be able to see the tracks of animals in the Maine winter snow. 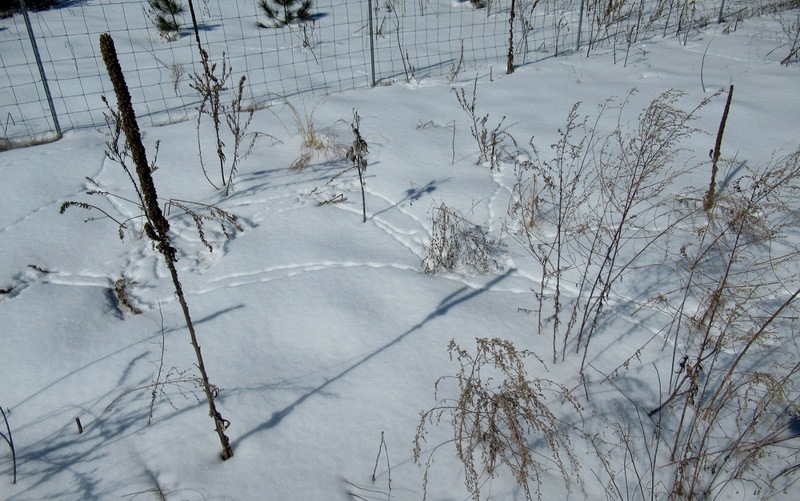 Back in February I had a chance to go out tromping with a friend, and it being the day after a snowstorm made for a bumper crop of tracks. A network of tiny critters making their way from seed to seed. 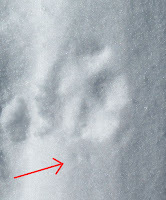 Above is a coyote track (there were a lot of these), in which you can see the telltale two-claw dots at the front of the foot (look at the red arrow directing you to the 6:00 point of the photo). To the right, you can see the full trackway, where the coyote carefully pads along the raised, packed runner left by snowmobilers in the fresh snow, very daintily stepping within the same spots as it moves along. You can see our bootprints along the edge of the coyote's runway to get an idea of scale. The last track set for this post (I'll come back with more later) was a real puzzler at first. You can see them below. The lateral footpads set behind long toeprints, with prominent claws showing on many of the tracks, indicated a number of species possibilities, but the size, only a few inches long, could only match one thing, if I am not mistaken -- a skunk! So I'm glad we only saw his tracks and not himself. We have heard reports from a bunch of places over the years: Poland, Troy, Brewer, Crawford, Casco, Harmony, York, and Naples for starters. 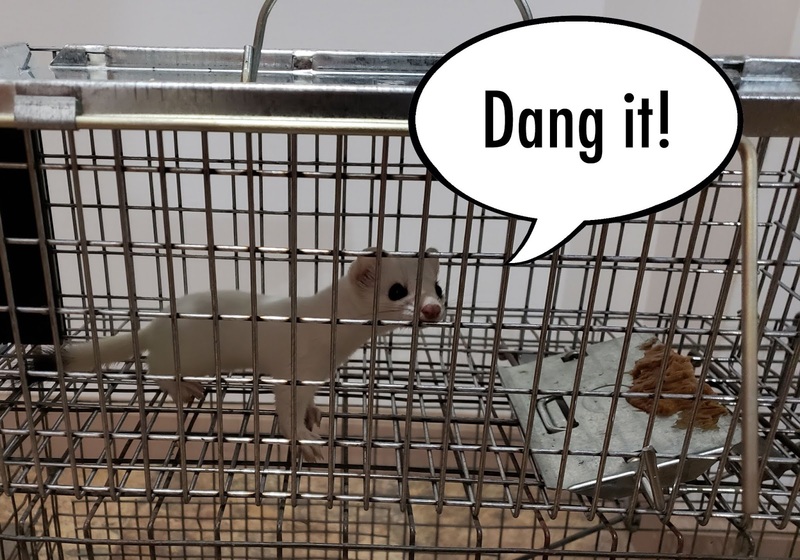 Today I have a treat for you -- one of the folks, Dave Taylor, who had an ermine as an unexpected houseguest earlier this year, had this to say: "We just recently caught a pure white weasel in our home with a live trap. Released him back into the woods on about 50 acres. Have several good photos and videos. Cute little guy." He was kind enough to send along some photos. I never realized exactly how petite they are! 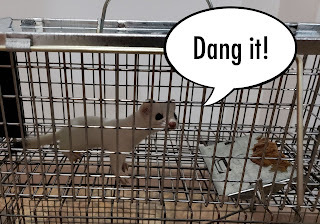 And here he is, safely stowed in his trap, ready to be released back into the wild, just as devilishly cute as ever! 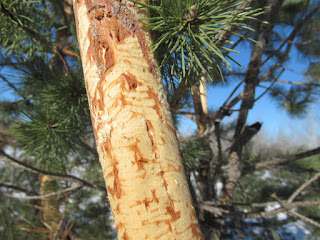 Adventures outside, between the light & the shadows: trees and so much more to see. This post is not so much about the reporting I do, and more about the philosophy and feeling behind it. 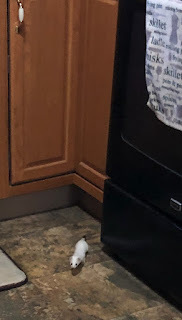 I don't often say much about this, beyond talking to friends and family about it -- but it seems important that some of these thoughts should find their way here onto my blog. I've been working on my second book for so long that it astonishes even me sometimes. Fitting it in around a grueling work schedule has been challenging, but this past year or so I feel like I've come much closer to figuring out a solution to fitting those pieces together. There are some more abstract elements that have become clearly very important as part of writing this book. 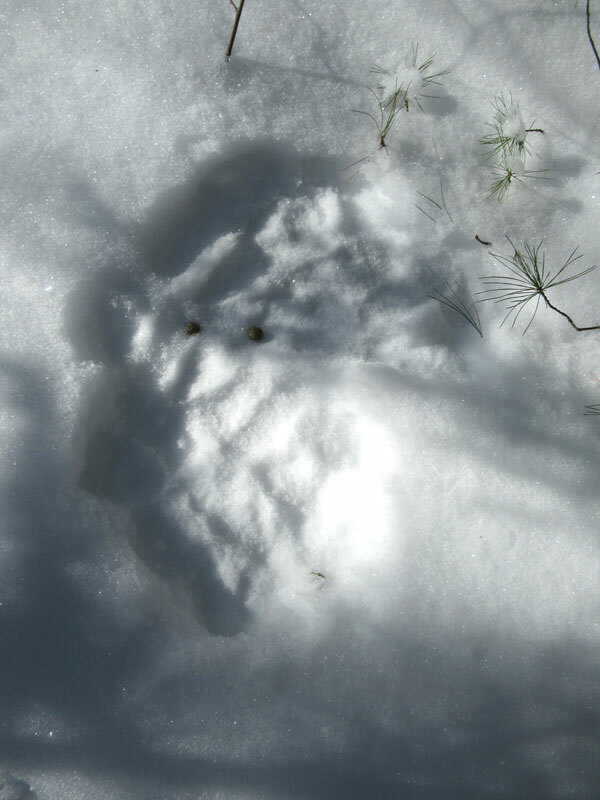 While my goal is to have Bigfoot in Maine done by the end of this year, the funny thing about it is that it will probably remain a lifelong pursuit even when the book is done. "Why?!" -- You may well ask. Why? 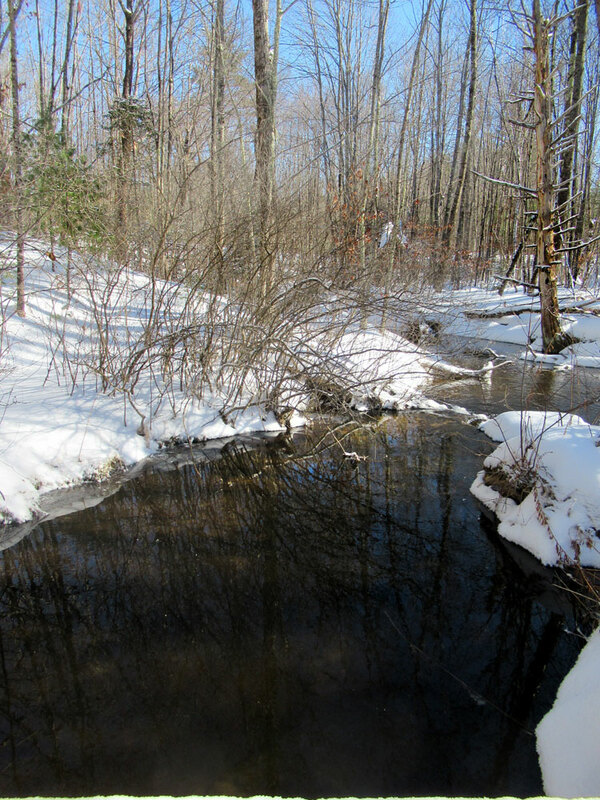 First, the truest reasons -- Because it draws me outside, into Maine's woods and hills and waterways. I crave more outdoors. In my everyday work life, the outdoors is so close, yet so far away. I cannot live without it. I live much better with more of it. We all need to not only look out, but also to go outside more often. There is nothing more real than walking into the wind and sun with the growing ground underneath your feet. Why? Secondly, the draw of curiosity on a growing mind -- Because there are more encounters out there that have never been told outside the small circle of family and friends. I can feel the truth of that in my very bones. Why? Thirdly, the bigger picture -- Because each link that appears in the chain of Maine oral history strengthens everyone who is part of it. Why? Fourth, the driving force behind it all -- Because I see myself as having a job -- a vocation. I am here to record these experiences that people have had, even if there is no acceptable "explanation" for them. Perhaps an explanation is not needed. Why? Fifth, the hoped-for outcome -- Because the record of any experiences given to me in the course of my work stands for those who come after, for those who have not told their own history yet, for those who might think that "no one wants to hear this," that "they're just going to think I'm crazy or an idiot." I've heard a lot of reasons from people as to why they don't want to come forward. It's okay to keep things to yourself. But if you have an encounter that defies all your prior life experience, something that doesn't fit into your known universe, I want to tell you that there are those of us who will listen. AND --- almost more importantly --- If we are honorable, ethical journalists (or even friends), we will listen off the record -- we won't tell anyone else anything you don't want known. The information is still useful. 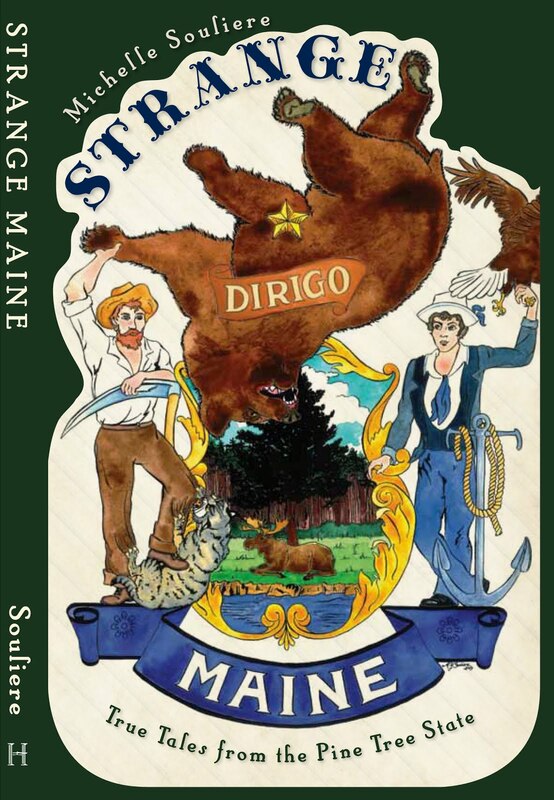 I am constantly piecing together the massive puzzle that is Maine in all its complexity, and you would be surprised to hear some of the tiny clues that have led to huge breakthroughs and realizations further on down the road. We will listen, whether you want the details repeated to help others who may be in the same boat, or whether you require us to never tell another soul. We will not assign you derogatory labels just because of something we haven't experienced ourselves happening to you. And those of us who are looking at the bigger picture will be grateful, and remember what you shared when you didn't have to. You might not hear from us again for years -- or ever -- but know that your piece of the puzzle is percolating through a repository of history where we are all Mainers together, each with our own unique experience of the state and all that is in it. Without each other, we are made less. Don't think your shot in the dark has been ignored, because these things take time. In those moments where your piece of the puzzle comes to light and fills in a blank, connecting other pieces together, it helps create an amazing picture of Maine history, rich enough for all of us to give forward as a treasure to those who come after us, asking questions in their own time that only we can answer now. All this work is done with no promise of glory, no promise of any tangible results. Those of us who listen, who dig deep when everyone else is doing something they think is more fun -- we are looking long. We are looking ahead as well as looking behind. We are also trying to get as close as we can to a 360-degree view, because we know things only become clear when they are given perspective. We never know what to expect, and that's a good thing. We make no predictions - we lay our cards out and hope to be given a chance to pay attention enough to see things unfold. And for those who shy away from telling because of ways they have seen others' stories being exploited by those who take them and don't care about anything but profit and personal gain -- I am sorry that this behavior exists in this world. It is unnecessary and violates everything I stand for. I respect your decision to back away from opening up because you have seen others injured in doing so. To those who have trusted me with their experiences, thank you. I came to you a stranger, and you were willing to take a chance that I could help other people with what I could glean from your accounts. This means a tremendous amount to me, and I try to never let out of my mind for long the reality of how lucky I am that you all looked at me, or heard my voice, or saw my greeting on the screen, and said, "Okay. I will give you a try." Thank you all -- those who contribute tales, and those who are eager to see the work when it is done -- all of you. 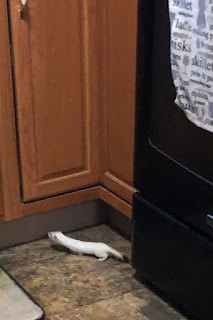 And thank you for reading what is probably my longest update ever. The seasons turn, and the daylight shifts. When I'm not in my bookshop or at home, you'll find me in the woods and out in the air, looking around at the huge world that is encompassed within Maine. Life is short, and I know I'll likely not see all the Maine places I hope to breathe in, but you can be darn sure I'm going to experience as many as I can, whenever I can. I hope you all get this chance too! 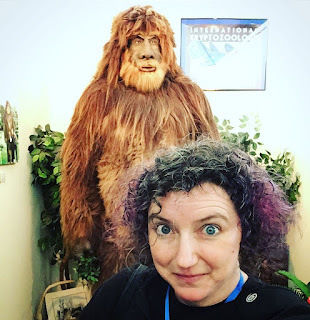 Me visiting with my old friend & neighbor, the Crookston Bigfoot, at the International Cryptozoology Museum. 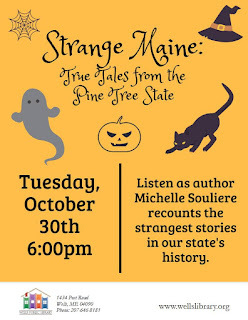 EVENT: Strange Maine at Wells Library for Halloween Eve! or call Wells Library at (207) 646-8181. Hi everyone! This post will run down the second day of the weekend's worth of speakers, and my photos will give you a glimpse of the folks involved, if you weren't able to be there. Click on any of the photos below to see a larger version of it. 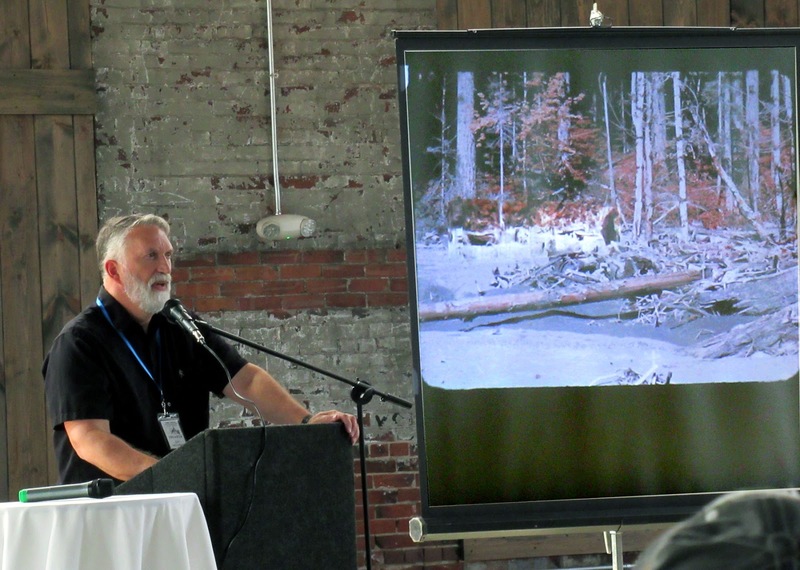 The 3rd Annual International Cryptozoology Conference was held on Sept. 1 & 2, 2018, here in Portland, Maine. Like the others before it, it was a great experience -- a chance to hear from experts on a variety of topics, and an opportunity to meet other people as interested in and as excited by the field of cryptozoology as I am. Loren Coleman, founder of the International Cryptozoology Museum, and his crew put together a terrific lineup of speakers. I wanted to hear every presentation, which works out great since the conference runs as a single-track schedule, allowing attendees to go to all of the talks without missing any of them. Day 2 started with a very welcome announcement from Loren Coleman that there would be another conference in 2019. 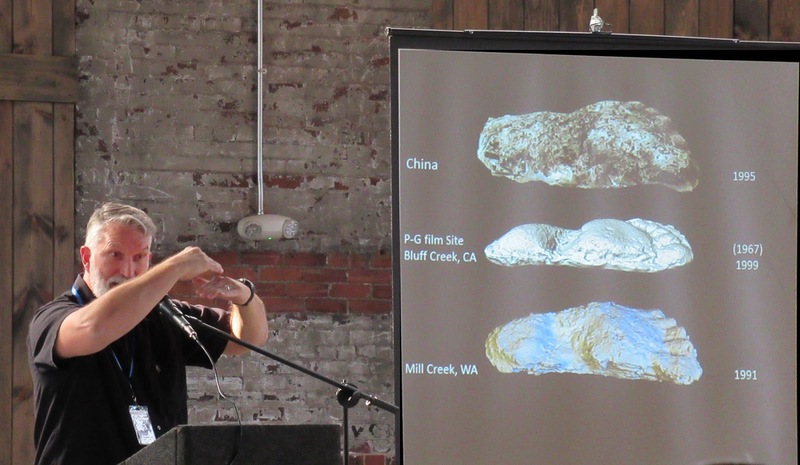 This exciting news was followed by Colin Schneider, giving his talk "Bloodsucking Beasties & Shadowy Stalkers: A Study in Cryptid Predators." Colin walked us through a smorgasbord of intriguing historic accounts of cryptozoological predators. Culprits included the inevitable Chupacabra, and lesser known ones such as the Vampire Beast of Bladenboro NC, the Abominable Chicken Man of El Reno OK, The Monument City Monster of Indiana, the Phantom Gobbler of Canton Township MI, and a number of other cases as well. Various theories for each were explored, and Colin alerted the audience of hoaxy oddballs such as photos of bloody handprints and appropriated photos from unrelated incidents, just a few of the problems facing researchers using online sources to find information about these bygone cases and others. Always fact-check your sources, in other words! Most often, these cryptid predators exhibit patterns related to either feline or canine predators. During the audience Q&A session following, fellow speaker Dawn Prince-Hughes asked if it was known whether habitat loss would trigger surplus killing (a common side-effect of these mystery creatures). A good question to puzzle over. Next on the docket was Andy McGrath, traveling far to give us his take on the Beasts of Britain! Although the UK is a closed system, so to speak, as it is predominantly a large island, that does not seem to restrict its variety of cryptozoological cases. For most of the talk, Andy focused on the water monster sightings, including multiple recent (August 2018) Loch Ness photos that have had UK cryptozoology fans very excited, earning 2018 the nickname "Year of the Dragon." One thing was clear -- for those who think all the UK lake monster photos are from the 60s and 70s (or earlier), they are missing out on all the current ones! For examples you can look up Bownessie, the Dragon of the North, the River Aeron Monster, and the Plymouth Crocodile, among others. From lake monsters Andy moved on to hairy ape men, again exhibiting a wide array of timeframes for historic traces and new evidence, from designs in heraldry and the Wodewose roof boss in Selby Abbey, N. Yorkshire, all the way up to the Box Hill Ape (2012) and Sussex Ape Man (2015). It should come as no surprise that UK Bigfoot cases are very controversial, and Andy pointed out that what some Bigfoot hunters may take as treesigns in the countryside could well be signals left by the existing gypsy communities traveling through out-of-the-way areas. Another point of discussion was the spate of Dogmen sightings, which Andy postulated may just be a way of re-branding the werewolf tradition to make it seem less embarrassing, more modern and believable. All in all, a lot was packed in to his talk! You can find him online at http://beastsofbritain.blogspot.com/ or on Facebook. 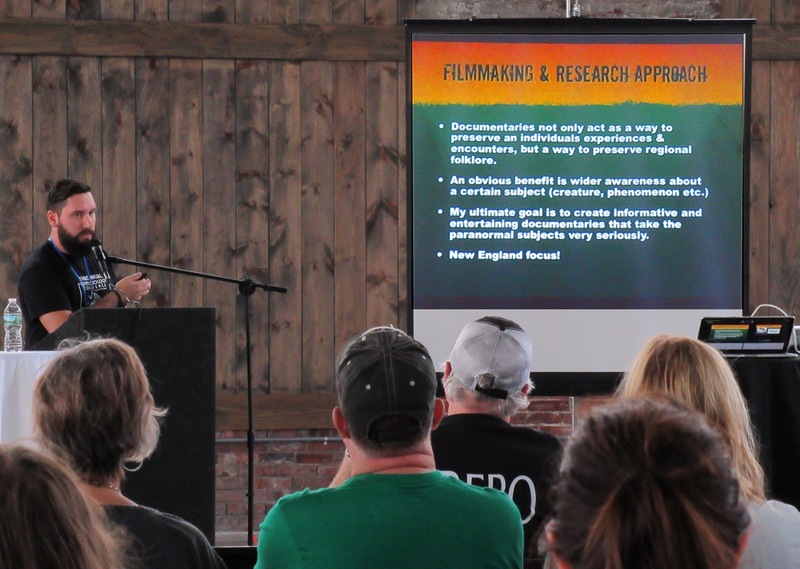 Next up was Aleksandar Petakov, who gave a terrific account of his latest work, filming the documentary Champ, about the legendary monster of Lake Champlain, as presented by Small Town Monsters. Katy Elizabeth, founder of Champ Search, stepped in and added her own viewpoint about investigating this particular lake monster. 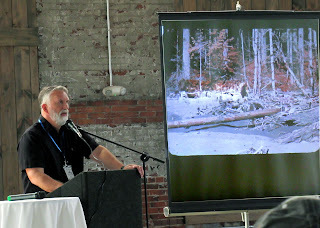 Next was my talk about Bigfoot in Maine. I almost skipped myself here, because I didn't have any notes about the talk, being in the process of giving it at the time. Ha! 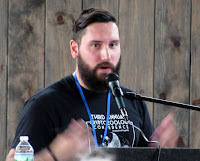 This talk was the first time I had attempted to summarize everything I've learned from talking to eyewitnesses about their encounters with inexplicable hairy hominids in the state of Maine, from York County all the way up to Aroostook County. I talked about the environment and biology of large mammals in Maine -- what makes anyone think they might be here, and how they could survive. In short, the potential is clear for anyone who has studied Maine's known large mammal species, such as the black bear. 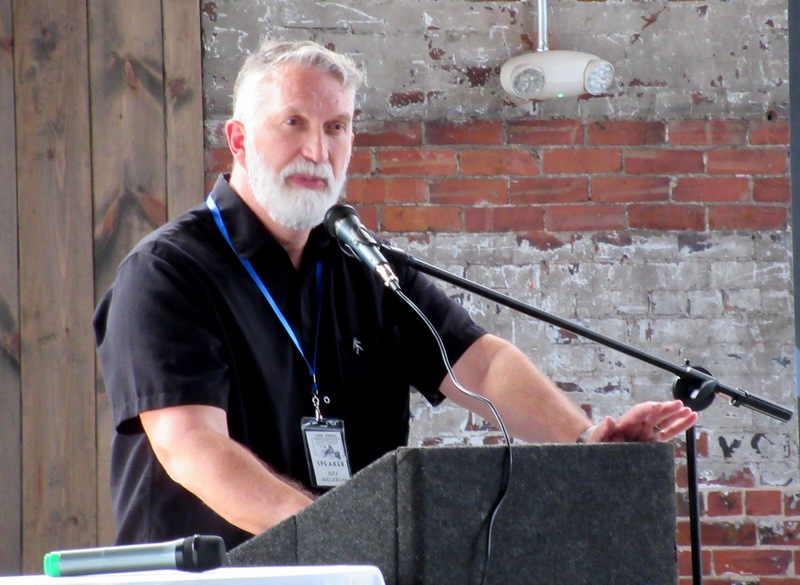 Last but certainly not least, the final speaker of the conference was Dr. Jeff Meldrum, a name well-known to anyone with a serious interest in the field of primate cryptozoology. Dr. Meldrum spoke about the Patterson-Gimlin footage, and why he believes it remains the most compelling photographic evidence to date, attesting to the physicality of a biological entity, and providing a baseline from which to establish a scientific context. 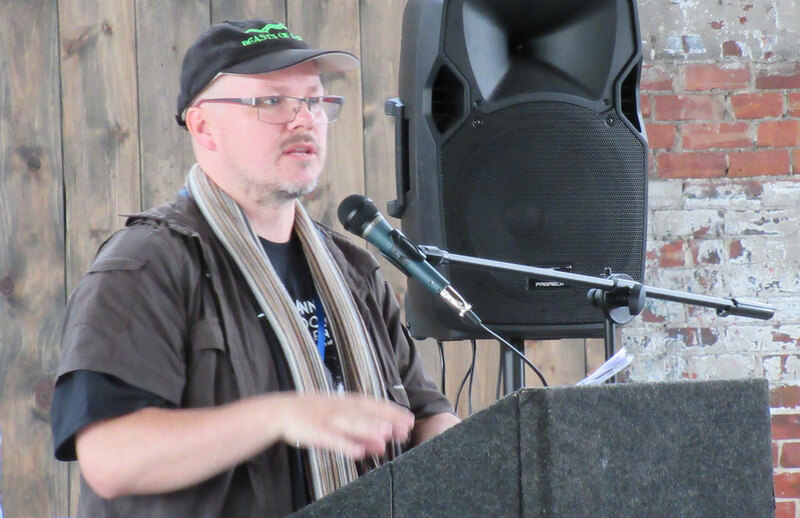 He spoke about the shifts that have occurred in views of evolution and anthropology, and how the old paradigm of the field caused preconceptions, which in turn conditioned the collection of evidence for decades. Newer paradigms are slowly coming into place, causing the reexamination of available information. The taxonomy in the field is rapidly changing and readjusting to discoveries initiated by these reevaluations. Dr. Meldrum also demonstrated his theories of possible hominid foot anatomy, as footprint casts and footprint fossils are among the few forms of evidence being brought forward for examination. Another anatomical aspect he discussed was the deep jaws and flat face (also visible in the Patterson-Gimlin footage), which he postulated to hold massive molars, smaller incisors and cuspids. As he explained, their teeth are their primary tools/utensils. Such a large jaw, with its accompanying massive musculature and the cheekbones housing it, would necessarily obscure the visibility of neck vertebrae, creating the famous "no neck" look ascribed to mystery hominids. All in all it was a fascinating talk, which gave the audience much to think upon. The weekend was terrific! I met a lot of interesting folks, both fellow speakers and conference attendees, and also caught up with many friends I hadn't seen in ages. After all was said and done, I still had time to go over and check out the latest additions of the International Cryptozoology Museum, just across from the conference location. I also got to catch up with my old friend and neighbor, the Crookston Bigfoot. I hope this has given those of you unable to attend the conference a glimpse at what went on. Maybe we'll see you there next year!